SHONA MacLean might be forgiven for having an identity crisis. After three successful historical thrillers under her own name, MacLean now finds herself being published under the more truncated name of S.G. MacLean, part of a re-branding that also sees the title of her third book, “Crucible of Secrets”, snipped to simply “Crucible” for its paperback release. “The thinking was that my name was too soft and feminine and men wouldn’t buy my books,” she explained. “Now they have decided they want to make the covers more masculine and my name less obviously feminine, but I am slightly concerned that anyone who was waiting for the book to come out might not realise it’s the same book or by the same person. “Crucible” — or “Crucible of Secrets”, depending on which edition you buy — is the third book in MacLean’s series about Alexander Seaton, a disgraced minister turned teacher who is caught up in the political and religious turmoil of Scotland in the early 17th century. The first in the series, “The Redemption of Alexander Seaton”, was set in Banff where MacLean and her family were living at the time. Since then Seaton’s adventures have taken him to Northern Ireland in “A Game of Sorrows” and Aberdeen (“Crucible”). MacLean has recently completed the fourth book in the series and is looking forward to following Seaton through the events of the period when King Charles I’s unwelcome attempt to bring the Scots Kirk into line with England sparked off the unrest that would lead to Civil War. “I’m very interested in his personal story and how it develops, but there’s always a murder mystery intertwined with it,” she said. However, MacLean adds that she has to be careful about giving too much political detail at the expense of the plot. “Sometimes you might have spent weeks researching something and it just comes up as a couple of paragraphs,” she said. MacLean is already well versed in the period. She completed a PhD in 17th century history and following a recent talk at Aberdeen University was congratulated on putting it to good use by her old lecturer. Historical crime has become a popular sub-genre in recent years and in Scotland alone crime fans can follow investigators from the Middle Ages to the mid-20th century. “I think it is escapism,” MacLean agreed. However, her setting of Stuart-era Scotland could be seen as putting her at a disadvantage when reaching out to a wider readership and she revealed that she had to stop her publisher putting a Tudor Rose on the cover of one of her books — despite the Tudors having never ruled in Scotland and setting her books a generation after the death of the last Tudor Monarch, Elizabeth I. “Because the Tudor period is so well known, there is a difficulty in people buying into something that’s a little later on,” she added. “I’m finding it with the independence debate it’s becoming more relevant now,” she revealed. 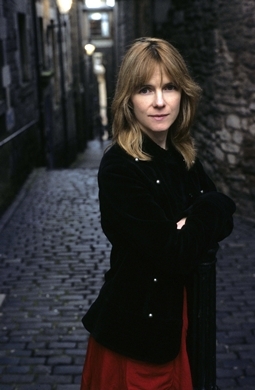 MacLean revealed she would also like to write more contemporary fiction, including one set against the background of the Pictish heritage of the eastern Highlands where she has returned to live. “It took me about four-and-a half years to write the first book. It was a life-long dream if you like, and getting all these rejections does make you downhearted,” she admitted. That paid off when a student on work placement with a literary agent picked her manuscript off the “slush pile”. “I don’t even know her name, but I’d really like to thank her!” MacLean laughed. Shona MacLean is not the only writer in the family. Her late uncle was Alistair MacLean, Scotland’s most successful thriller writer and author of “Where Eagles Dare”, “Ice Station Zebra”, “The Guns of Navarone” and many more. Though she acknowledges she might not have received some of the media attention she did as a novice writer without that connection, it was something she was hesitant to play up. “I didn’t want it to look like I was hanging on his coat-tails, but I was very proud of him and fond of him and when I do events I still get people telling me how much they loved his books,” she said.